Happy Monday peeps! I hope you all had a great weekend. I had a busy one, finished up 20+ Christmas pillow designs and then made a run to IKEA for pillow forms. 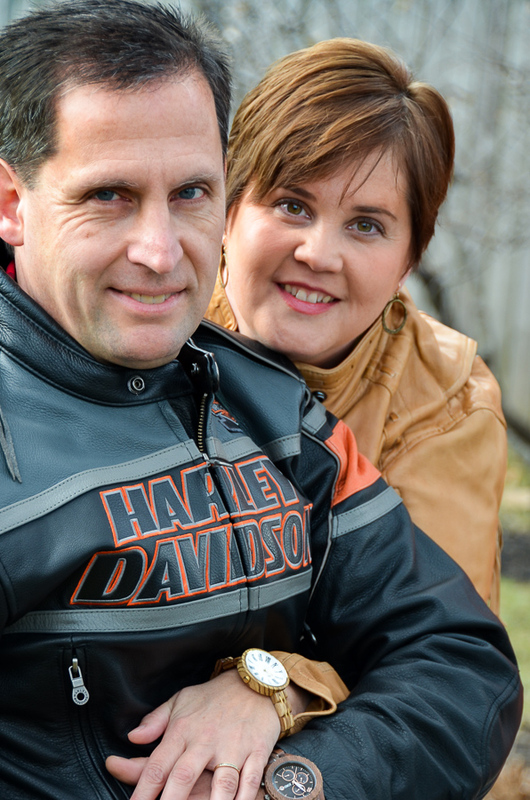 I have a brand-new, really cool, beautiful bike so I went for a bike ride on Sunday afternoon with my husband and teenager. Watched some football. Did a bit of damage control on our home – cleaned it up a bit to make it livable for another week! Make sure to check out what my friends came up with – you will find the links at the bottom of this post. 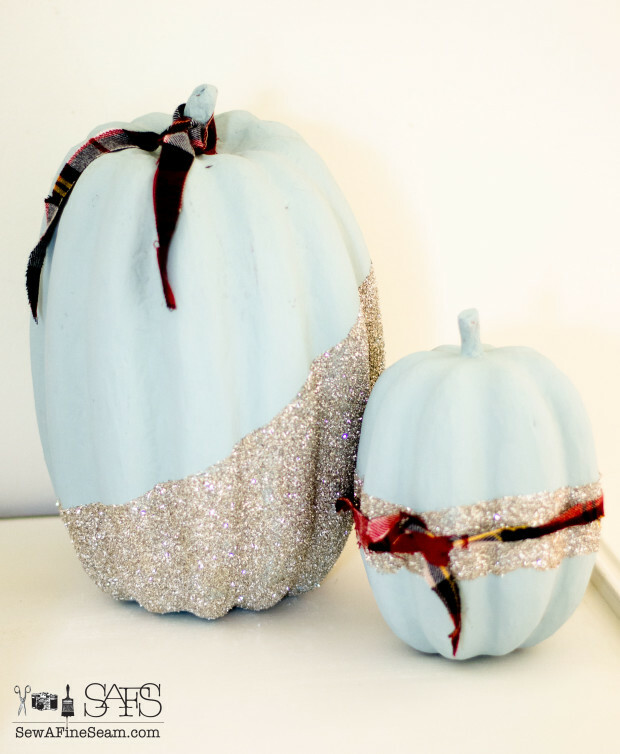 I came up with some Painted and Glittered Faux Pumpkins. I love real pumpkins and will be getting some soon to use for decor. But it’s still early and I wasn’t quite ready to get the real pumpkins yet. I’d been looking at the paper mache pumpkins at JoAnns but I always passed because they were not on sale. Then one day when I made a stop at Jo-Anns I got a text that included a 30% off coupon. I promptly swung through the seasonal aisle and grabbed a couple pumpkins. 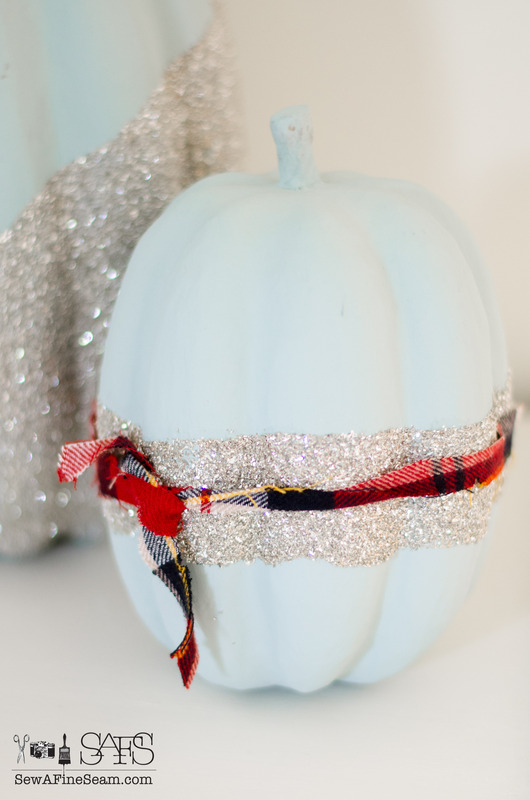 My first plan was to use glass glitter on the pumpkins. Then I decided they would probably look best if I painted them first and then added the glitter. I grabbed some paint out of my stash. It turned out being such a fun, light green-blue color when it dried on the pumpkins – looked just like the heirloom pumpkins I like to buy! I still wanted some glitter though so I pulled out the Elmers school glue and glass glitter. You can find this glass glitter in my online shop – it’s my favorite glitter and I’ve used a lot of different glass glitters! I decided I instead of covering the pumpkins completely with glitter I’d just do part of them. Start by drawing a line along the edge you want for your glitter. Add a bunch more glue on the side of your glue line that you want covered with glitter. Use an artist brush (an old one or a very inexpensive one!) to spread the glue. Cover the whole area you want glittered with glue. Holding over a piece of paper, sprinkle glass glitter liberally over the area that has glue on it. Gently shake the extra glitter off onto the paper. Carefully lift the paper and dump the excess glitter back in the jar. I only did one side of my pumpkin at a time. After glittering the first side, I added glue to the second side and added glitter. If you miss spots you can always add more glue and glitter. The smaller pumpkin just got a glitter stripe. 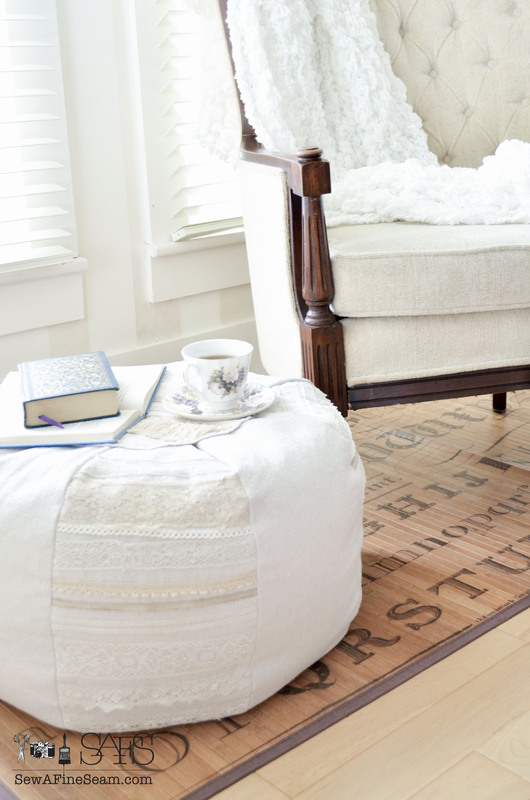 Different patterns and textures make decor more interesting and fun. Let the glittered pumpkins sit till glue dries completely. You can gently tap off any glitter that is not securely glued after the glue is dry. Now they are ready to add to your fall decor. And the fun glitter, and the fact that they are faux, makes them work clear through Christmas if you want them to! 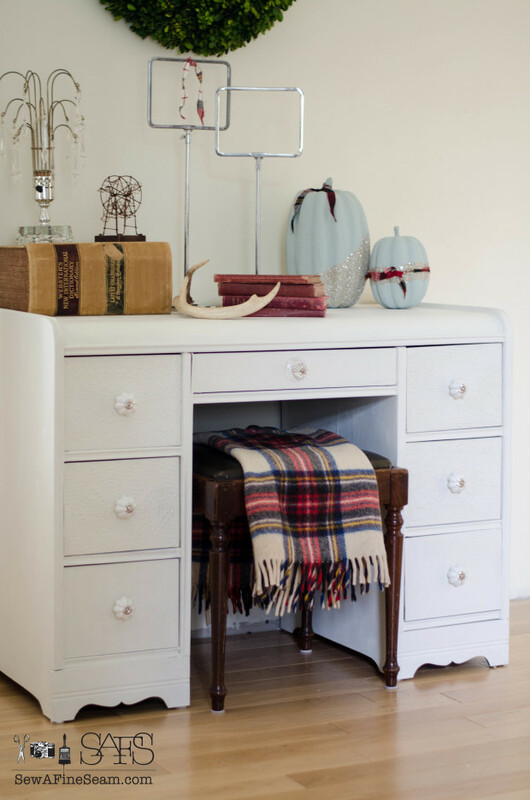 For fall I’ve added lots of bits of plaid to my home. Here I tied strips of plaid fabric to my pumpkins. This red plaid will work for Christmas too if I want to use it clear through to the new year. 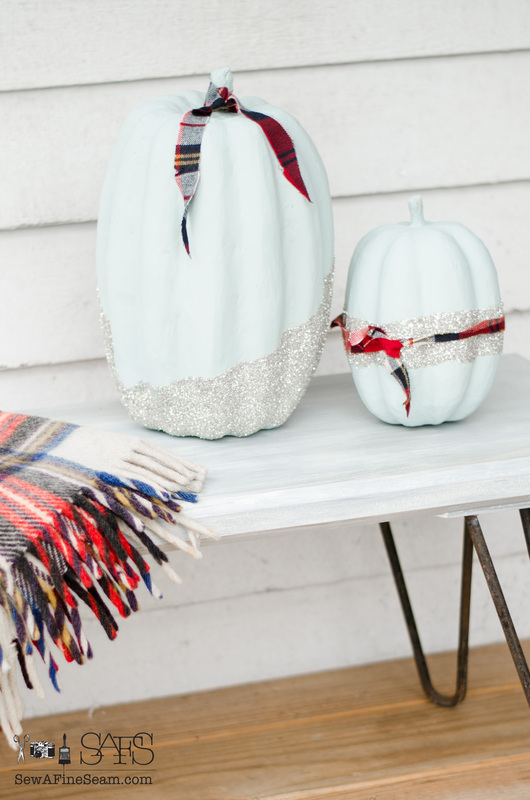 I love how the glass glitter and the plaid complement each other. 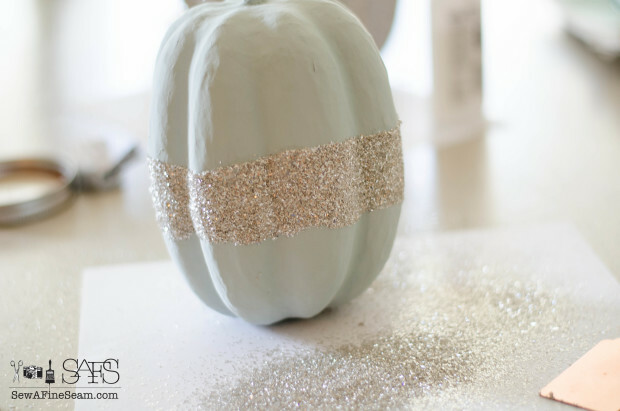 You can also add glass glitter to real pumpkins if you don’t want to spend the money on the faux pumpkins. I got the faux pumpkins with a coupon and I had the cash to spend on them. Some years I wouldn’t have had the cash to spend. You can get real pumpkins really cheap from a local farmer, or even grow your own for super cheap! 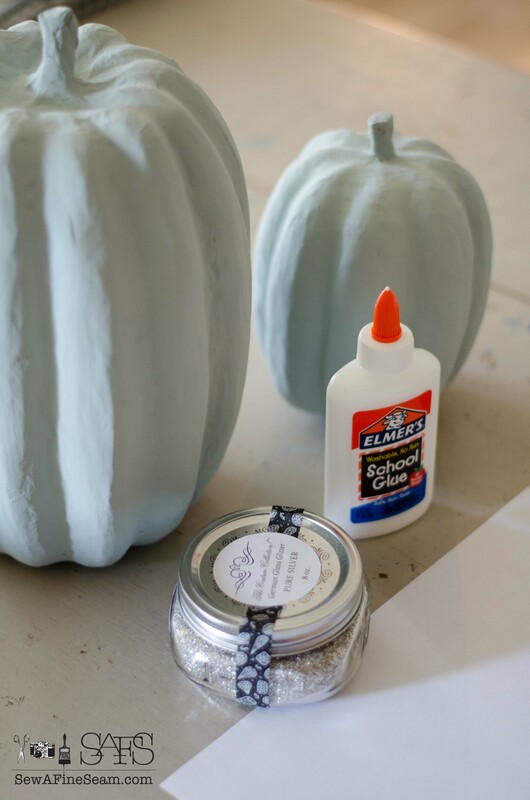 And if you want white or blue pumpkins but can’t find any, or they are out of your budget, you can always paint the orange pumpkins to create that heirloom, Cinderella look. These pumpkins, along with the plaid, the antlers, vintage books, and some old signs holders created a fun fall vignette in my living room. The desk got a complete makeover just in time to be the perfect backdrop for my fall vignette too. I’ll have the details of that up on the blog on Wednesday. And now you need to check out what my friends did with pumpkins. 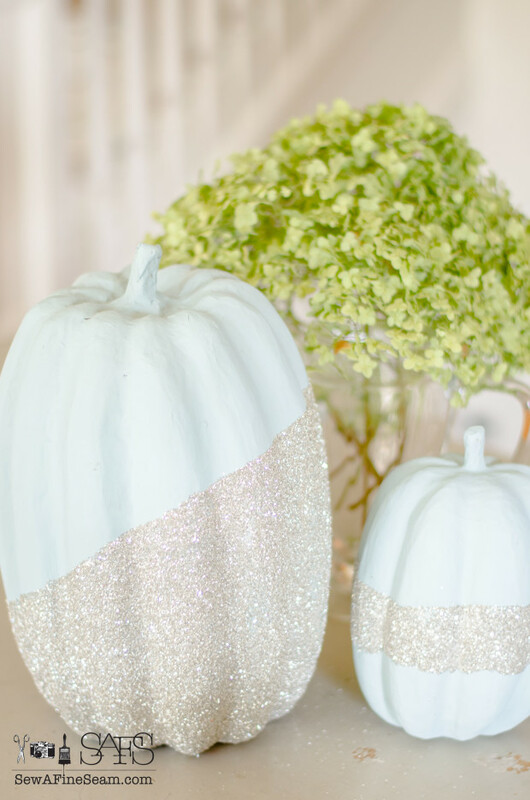 Very Cute Jill… I love how you added the glass glitter looks perfect with the color of the pumpkins. Thanks Tammy, I was really thrilled with the color of the pumpkins, I hadn’t thought about it looking so blue/green when it was dry! I LOVE LOVE LOVE the way the pumpkins turned out! Such wonderful designs and the perfect amount of glam and rustic twist with the plaid. Glass glitter is so beautiful eye candy! These pumpkins are fabulous! My daughter likes to say that glitter makes everything better, and I have to agree. Love how that say fall with a bright and shiny look. Thanks Sarah, I love glitter too and the glass glitter is my fav! 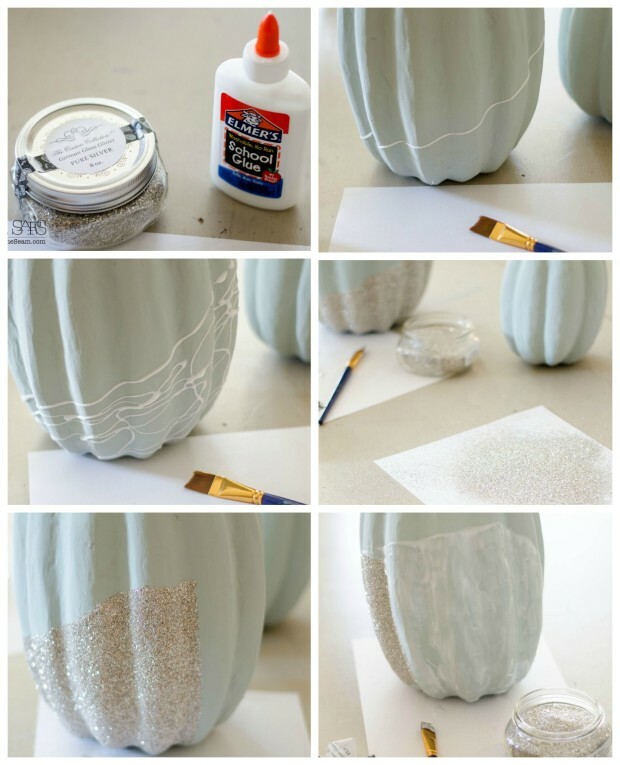 Pumpkins for decor are so much fun! I love your glitter. I still love my glittered pumpkins. Glass glitter is the best!